I'm a sucker for anything enameled. 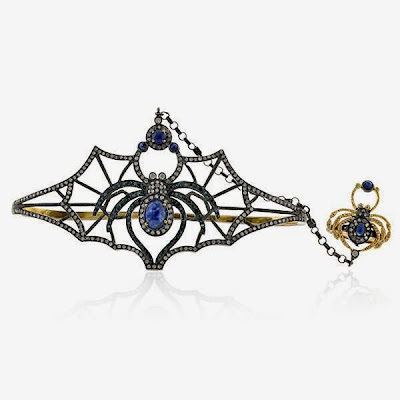 Here's a spider brooch that's a reproduction of an 1800s original. At first glance I thought this was a pocket watch, but it's a spider pendant. It's made with black onyx, gold and diamonds. I like the sweet simplicity of this Edwardian silver and topaz spider brooch. These modern spider earrings are totally out of my reach (too expensive), but I like looking at them. Here's a similar pair of spiderweb earrings, but they're rounder. This spider necklace is made from petrified wood. Not everyone will like the blue gem in this spider slave bracelet, but I do. This is sort of a hot mess! It's a rare Betsey Johnson "Dark Forest Spider Skull" statement necklace. I really like the look of this black diamond onyx spider necklace. Elegant! Here's an unusual spider bangle. It features pink tourmaline, diamonds, sterling, and yellow gold. This cute little fella is a Victorian style engagement wedding bracelet.